While not everyone agrees, I still firmly believe that building relevant Facebook Page Likes is as important as it’s ever been. 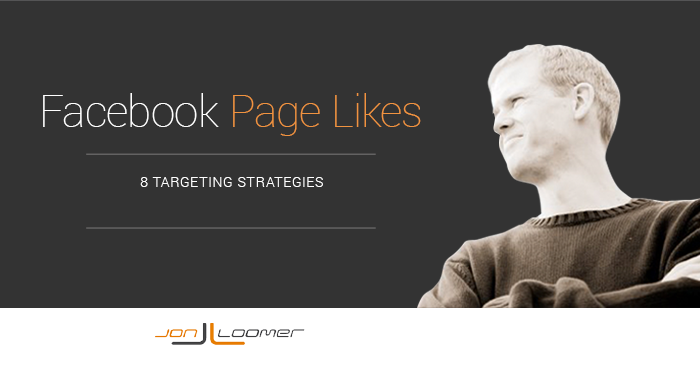 As a result, I keep a Page Likes campaign constantly running. I was going through my regular Page Like campaign maintenance when it occurred to me that I should share this exercise as an example of ways that you might target. I’ve been tweaking and optimizing for years now, and it’s a tried and true process that works for me. 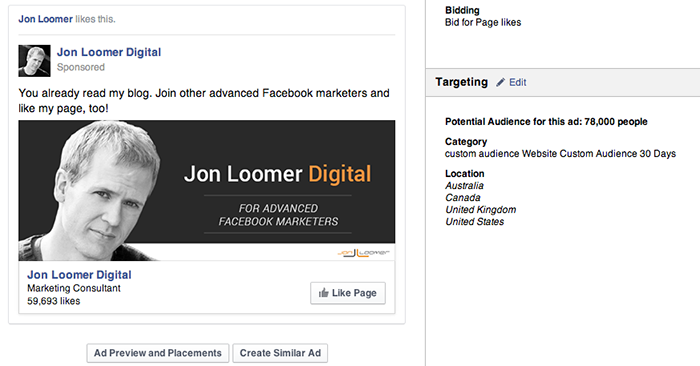 I create a different ad set for each audience (which is actually what Facebook recommends), and then each ad set consists of image and copy variations that will reach that group of users. 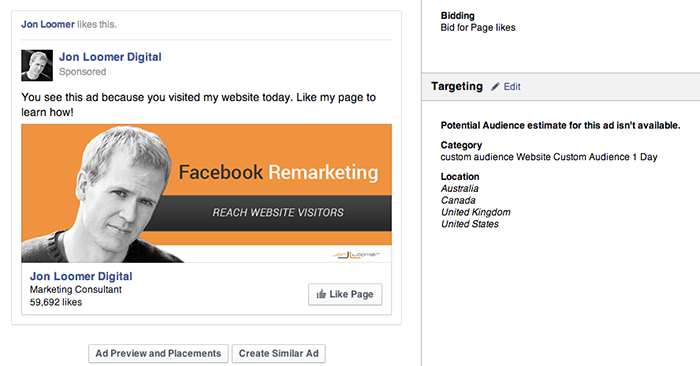 Since I target eight groups of people (those groups are listed below), I end up with eight ad sets that all fall within a Page Likes campaign. When I launch the campaign, I vary the budgets based on the size of the audience (audiences with under 10,000 people, for example, will have a budget of $5/day). But this will be adjusted as I see what does and doesn’t work. I create imagery and copy that appeals to the target demographic. For the current campaign, I use one set of copy for each audience and four image variations. Much more would water down the results depending on the budget. This is a logical group of people to target first. Target those who are on your email list, but aren’t currently fans. You do this with Custom Audiences. I called out the fact that these people already get my emails, but that’s also because I know my audience. Depending on your audience, you may want to be careful with that language as it could raise privacy concerns from those new to that type of targeting. Of course, the number targeted is bound to be small. Even though my email list is more than 25,000 strong, it dwindles in a hurry for targeting once you remove fans, the addresses that don’t match up to Facebook users and those who fall outside of the four core countries I’m targeting. This is why you should also watch your daily budget based on audience size. With a potential audience of no more than 3,600 people (it will be far less after optimization and accounting for those not online), budget doesn’t need to be more than $5. I’ll also monitor to make sure my oCPM doesn’t get out of hand, which is always possible if budget is too high for the potential audience served. Note that I could segment this list and focus only on paying customers, for example. Truth is that my email list is about two and a half years old, so some of these people are stale and unlikely to act. But given I’m already down to 3,600 people, there’s no reason to cut that number down any more. If you get decent website traffic, this is something you absolutely should do. 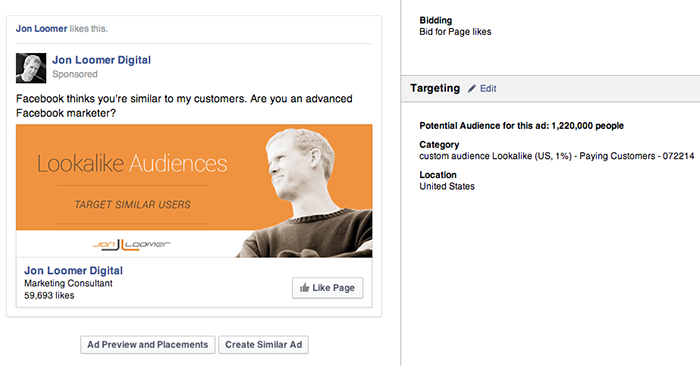 Website Custom Audiences allow you to target Facebook users who visited your website recently. I create Website Custom Audiences for many pages and durations, starting at one day and going up to 180 days. The shorter the duration, the more relevant. Someone is much more likely to act on your ad if they visited your website today while you are top of mind than if they visited 180 days ago and already forgot about it. I get more than 10,000 visitors to my website per day, so this gives me a decent number of people to target. 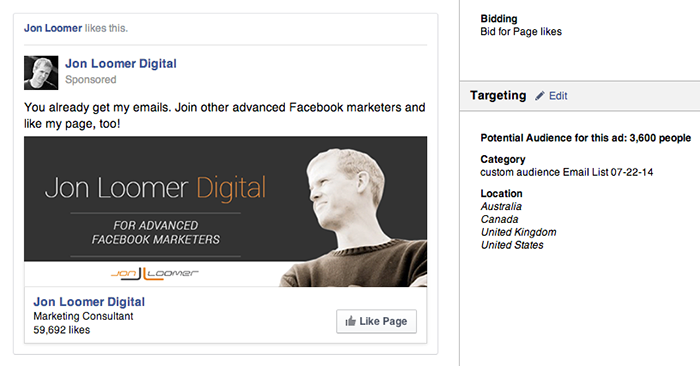 Of course, that number drops in a hurry when you account for optimization and those on Facebook in a given day. Once again, address your budget accordingly. You’ll notice that I call out the fact that the audience visited my website today. 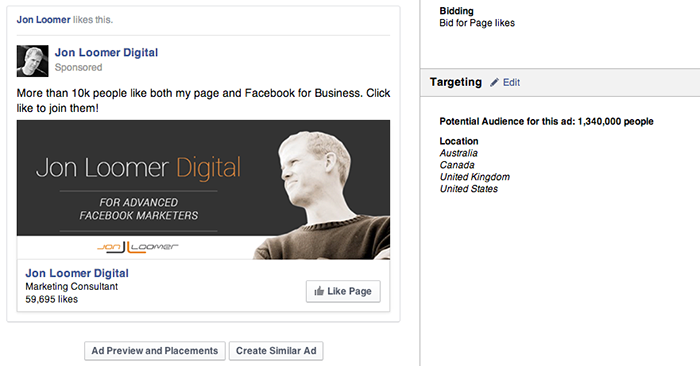 This should appeal to my target demographic of advanced Facebook marketers. It may not appeal to many other groups. If you don’t get as much website traffic, you may want to expand the net. I like to experiment with 30 days anyway since a larger audience sometimes means lower oCPM costs. Once again, I call out the fact that those seeing the ad have visited my website. This could be creepy to some, but it works for my audience. I prefer to focus first on people most closely connected to me. But that doesn’t mean I stop experimenting with other groups. 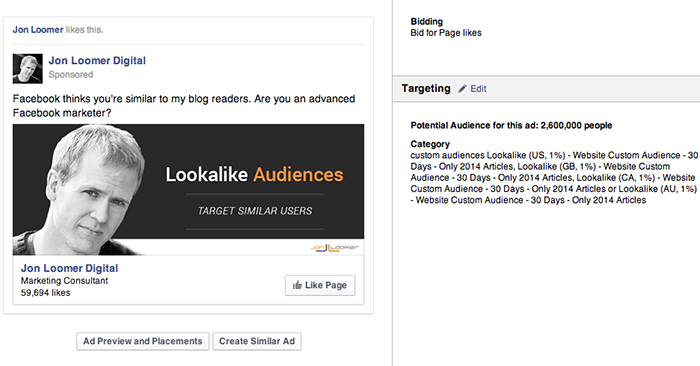 Lookalike Audiences are the next in line for my targeting prioritization. Facebook matches up the interests, demographics and activities of a particular audience and finds other users similar to them. In this case, I’m using my most important audience — my paying customers — as a model for my Lookalike Audience. While the initial group may have been too small to target, the Lookalikes help me target a much larger group of people similar to them. 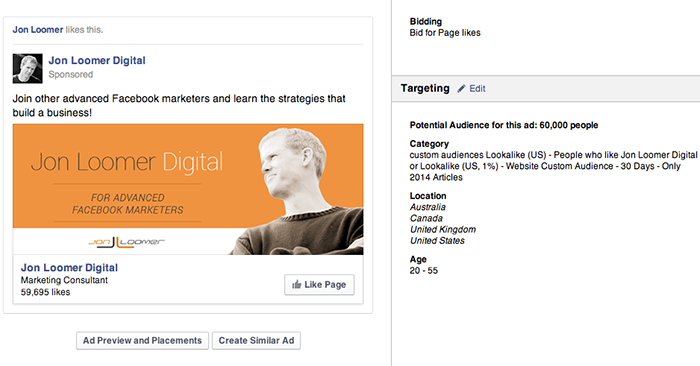 You can also target people similar to those who visit your website with Lookalike Audiences. In this case, I’m targeting users similar to those who visited my website during the past 30 days and read an article published in 2014. One more Lookalike Audience to consider is modeled off of your current fans. Of course, you should only do this if you have a high confidence level in the quality of your current fan base. If you bought fans or used any strategies that would water down the value of these people, Lookalikes probably won’t help you. Interest targeting isn’t something I do much of. In fact, I even labeled it “dead” in a blog post not long ago. But there can be exceptions. Using Audience Insights, I discovered that more than 10,000 of my fans in the US also like the Facebook for Business page. In fact, more than 16,000 in my four core countries like that page. That was enough for me to take notice. You could target many interests, but it’s then difficult to see what works and what doesn’t. So in this case, I’m targeting only the one that is most relevant to my fan base. 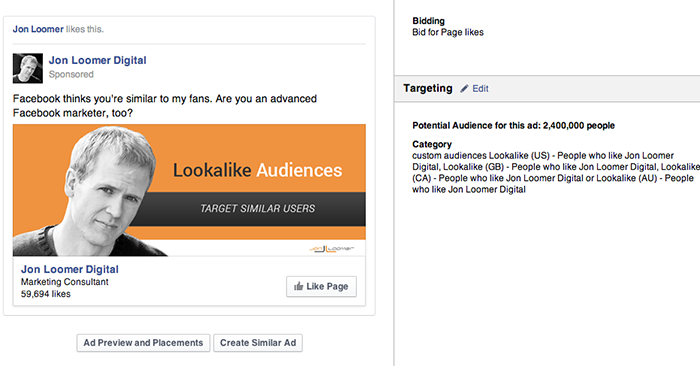 I could choose to create a separate ad set targeting fans of Social Media Examiner. While relevant, I don’t consider it as relevant as Facebook for Business since Social Media Examiner deals with more than just Facebook marketing. These are again qualities I found were important with my current audience using Audience Insights. 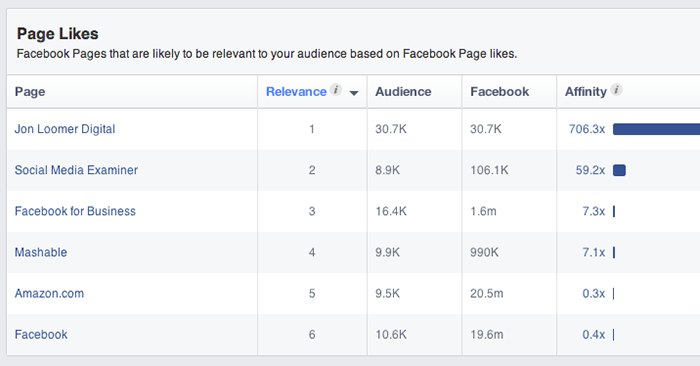 These are the groups of people I target when building Facebook Page Likes. How about you?